Behold! 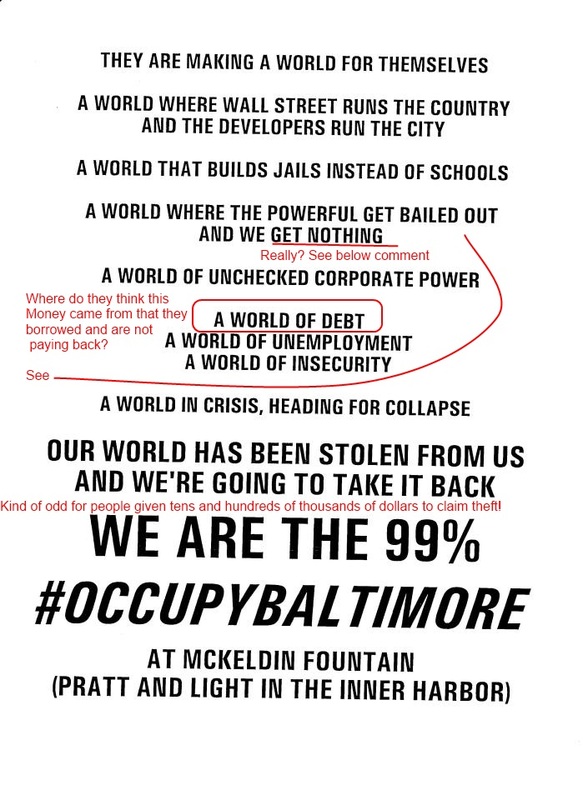 The 99% of Baltimore! The family and I took a trip to Baltimore this morning to tour the USS CONSTELLATION AND submarine USS TORSK in the Inner Harbor and just happen to come across the OCCUPY BALTIMORE squatters. I can't say that I'm impressed. It more appeared to be a pathetic gathering. 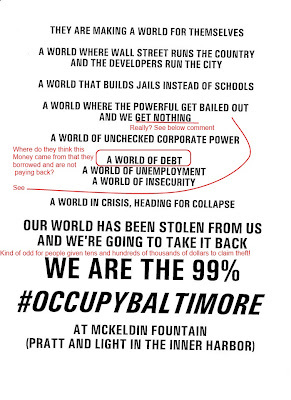 Not the 99% that you would think. I don't have any closer pictures as I really did not want to interact with anyone there. I don't deny that many of them probably are in difficult situations. That said, I really don't see why people who have made bad decisions should be rewarded by having those of us who are in better control of our lives pay up to meet their obligations. As you can see from their flyer,they are continuing with the idiotic theme they everyone is getting bailed out but them. As I have commented before, everyone else needs to be bailed out because they borrowed and then failed to pay everyone else back. Giving these people more money is a waste.They see what others have and instead of trying to work hard and save, they would instead prefer to take from the rest of us. One last thought. Statistically, I am in the top 10%. I think the tagging of these disruptions as on behalf of 99% of the population is an example of how the left likes to hijack issues. Just how much of the population are they representing? Obama 'Jobs Bill'? - School Renovations? Is it me or does the Obama Jobs Bill have nothing to do with encouraging job growth in America? The more I hear about this plan, the more it stinks. One of the huge issues I have is that the plan intends to spend money to upgrade schools. It sure sounds nice, but education is something that is traditionally funded within the states. It is after all one of the things that your property taxes pay for. The issue here is not whether it is a good idea to renovate schools or not. Sure it is. This issue here is how it is paid for. Schools have budgets and many of those needs to be passed by the local population that is asked to pay for it. Spend too much money and the voters are going to start saying no to 'extras' such as after school activities and sports as well as renovations. So when the local community refuses to pay for these things, why should the Federal Government step in and spend the money on people who have decided not to spend their own money on these things? There is lots of talk about 'fairness' and there is nothing fair in this process. Each state has it's own opportunity to tax. Some tax a little and some tax lots. And some elect not to tax income. So when the President steps in and promises to spend money the locals refuse to, this is little more than a subsidy to that state's voters. Worse, this is a sort of mission creep by the Federal Government into an are that was traditionally handled by the States. This mission creep will increase Federal spending. The same applies for the other kinds of renovation work the Presdent is proposing for transportation projects. This is outside of the work on Federal highways. Again, this is work that should be paid for by the people of the state. Unfortunately, the President can get away with this because for some reason people seem to forget that they pay state income and local property taxes. The quote above is from the President's speech from September 13th in Ohio. Again, it is up to the states to decide how much they are willing to spend on education. Who is to say what the right number of teachers is? It could be that many of the jobs that have been let go, were added during years of healthy tax revenue without proper regard to whether the positions were genuinely needed or not. This is what Governments are supposed to do when money gets tight, either find more money, or reduce expenses. One more thing. None of these jobs is going to create new tax revenue for the Government. These are State Government jobs. The money to pay for these jobs comes from people paying their taxes and mainly private industry jobs. It is those kinds of jobs, manufacturing, energy, building, service, etc that the Government needs to encourage. The President can easily set in motion a huge business boom. All he need do is get out of the way of energy production of oil, coal and gas and power plant construction, whether it be natural gas, coal, nuclear or hydroelectric. These two things will then spur the demand, and funding, for improved infrastructure, simply to get the supplies to help build the oil, gas and electric businesses. If we can get this moving, lots of other industries that support this will follow.